Get in on the race day fun with an 8k (4.97 miles) run or walk through downtown Richmond and Virginia Commonwealth University. You’ll be the first on the course to experience our awesome crowd support and enthusiastic spectators. Go your own speed, as this race welcomes all paces, from the super-fast, to those just starting out, and walkers as well! Enjoy our famous downhill finish and party on the riverfront. Celebrate with pizza and a Sierra Nevada beer while you wait for the half and full finishers to join you! All participants receive a medal…because we know you want that bling! You’re running Richmond!! Let us roll out the red carpet for you, and add that one-of-a-kind touch to your race experience. You’ve trained hard, now it’s time to take it easy and run in style. Go ahead, you deserve it! Every 8k runner receives a special technical race shirt along with a medal at the finish line and is admitted to the post-race celebration with plenty of free food, drink, and lots of smiles and pats on the back. Overall awards are determined by clock time; age group awards by chip time. Cash awards go to the top five overall finishers, male and female. Additional awards will be presented to the top five in all age groups. Age groups are: 9 & under, 10-14, 15-19, 20-24, 25-29, 30-34, 35-39, 40-44, 45-49, 50-54, 55-59, 60-64, 65-69 and 70-74 and 75 & up. Age group winners will receive their personalized awards by mail after the race. The Awards Ceremony for overall winners in each race will take place in the finish line area immediately after they have all completed the race. Participants in the 8k will be corralled for the start based on predicted times listed on their completed entry form. The 8k begins at 7 a.m. sharp. Note: Start Corrals and race start time are subject to change. 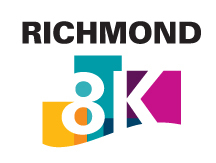 The age minimum to register for the Richmond 8k is 8 years of age on or before race day.